Osakasuki (Acer pamatum 'Osakazuki') is renowned for its spectacular autumn leaf colour and will make a really worthwhile addition to a garden. 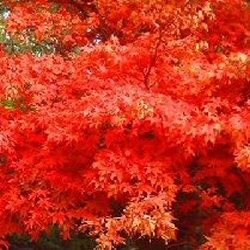 Its large, classic maple shaped leaves are a pretty olive green colour during spring and summer, but it is Autumn where the real surprise awaits with long lasting fiery scarlet tones. Somewhat slow-growing, so ideal for a low maintenance garden, you can expect this tree ultimately to reach a height of 6m (20ft) with a similar spread. Grown as part of a Japanese maple collection, Osakasuki, will complement the other Japanese maples we have available. The RHS thought this Acer so fantastic they gave it their RHS AGM (Award Of Garden Merit) which is very tough to get. We have heard of some trees trying to bribe the upper echelons of the RHS with boxes of Wurthers Originals with zero success. For best results plant in partially shaded position to avoid sun scorch and stay away from chalky soil which can be found near very old schools that regularly had their windows open and teachers with bad aim. For the purists out there, you could mix the excavated soil with ericaceous compost to improve foliage colours. If planting in the summer, water well every few days to a week depending on the weather until the Acer becomes established which usually means until the end of the growing season. If planting outside of Spring or Summer then you don't need to do this. Rain water is a better option than tap water because Acer Osakazuki prefers acidic to neutral soil conditions and tap water is alkaline. This tree is supplied at a height of 90-150cm in a 7 - 15 litre container, which means that the tree can be planted any time of the year and with better results than either bare-root or root-balled trees.